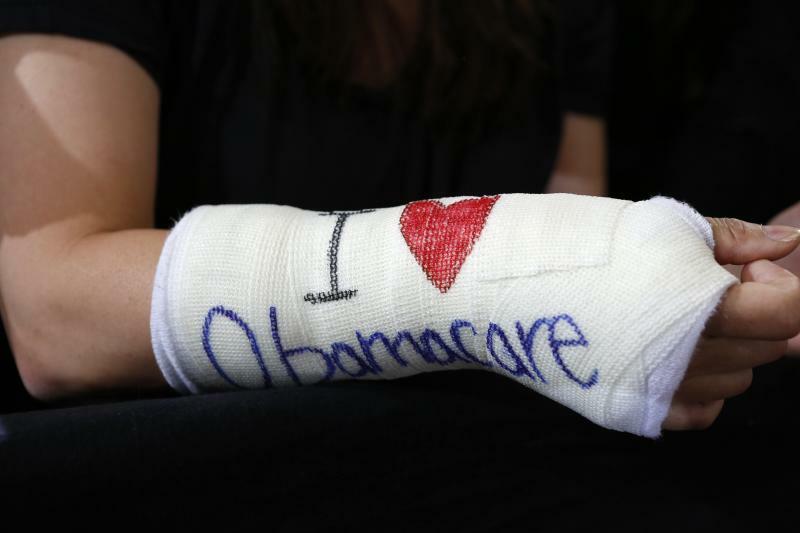 Cathey Park of Cambridge, Massachusetts wears a cast for her broken wrist with "I Love Obamacare" written upon it prior to U.S. President Barack Obama's arrival to speak about health insurance at Faneuil Hall in Boston in this October 30, 2013 file photo. President Barack Obama struck a defiant tone for his dealings with the new Republican-led Congress on Tuesday, calling on his opponents to raise taxes on the rich and threatening to veto legislation that would challenge his key decisions. REUTERS/Kevin Lamarque/Files (UNITED STATES - Tags: POLITICS) ATTENTION EDITORS - THIS PICTURE IS PART OF THE PACKAGE "STATE OF THE UNION". TO FIND ALL 17, SEARCH "OBAMA DECISIONS"
Just 18 months ago, a Republican fantasy seemed about to come true. The Affordable Care Act was in the midst of a disastrous rollout plagued by dialup-stye technology snafus. President Obama had sabotaged his own health-reform plan by falsely promising that everybody happy with their health plan could keep it. As frozen computer screens and canceled policies generated a tsunami of bad publicity, it seemed plausible that Obamacare might be such a flop that voters would clamor for its repeal when the next presidential election came around. Now, with the next presidential election underway, nothing of the sort is happening. The problems that marred the rollout of Obamacare have been fixed. The law, meanwhile, is reducing the number of Americans who lack health coverage as intended, as a new report from the Rand Corp. shows. And just as important, many unintended consequences that critics of the law predicted have failed to materialize. “Socalized medicine” hasn’t materialized. One big concern about the ACA was the possibility it would undermine the current system of employer-provided health insurance and lead to a market in which the government is the dominant provider of healthcare. There’s no sign of that happening. The Rand study, in fact, finds that the number of people with insurance provided by their employer rose by 8 million between 2013 and early 2015, as the chart below shows. That gain exceeds the number of jobs created during that time, suggesting that some people who could have gotten coverage through their employer before but didn't have changed their minds and signed up, since the law now requires them to have coverage. If anything, that strengthens the system of employer-sponsored insurance, which is how 60% of non-elderly Americans get their coverage. Obamacare hasn’t killed jobs. Republicans repeatedly lambasted Obamacare as a “job killer,” but it doesn’t seem to be that, either. Since the law fully took effect at the beginning of 2014, employers have created about 3.5 million new jobs, a very strong pace of job growth comparable with the late 1990s. The Gallup job-creation index, meanwhile, recently hit the highest levels since 2008. It's unlikely Obamacare is directly contributing to job growth, but it sure doesen’t seem to be harming it. The law has helped the uninsured. The number of non-elderly adults who lack insurance has plunged from 42.7 million right before Obamacare went into effect to 25.8 million now, according to Rand. That’s an extra 16.9 million Americans who have gained coverage in less than 2 years. There aren’t that many people negatively affected by the law. If Obama were to get a do-over on the ACA, one thing he’d probably change is the provision requiring every policy to cover a minimum set of services, which led to the widespread cancellation of certain types of policies and the repudiation of Obama’s own claim about everybody being able to keep their insurance plan if they wanted to. But the total number of people who lost coverage has turned out to be smaller than the huge controversy may have suggested. The Rand study found that the number of people with “nongroup” coverage—plans purchased individually from an insurer, rather than provided through an employer—dropped by 1.9 million between 2013 and 2015. At least some of those, and possibly most, were policies canceled against the policyholder’s wishes because the plan failed to meet minimum coverage requirements. The harm done to nongroup policyholders, in the name of helping others, is a notable and unnecessary flaw of the ACA. But 1.9 million policyholders is only 1.1% of all non-elderly adults with insurance. There won’t be a lot of voters going to the polls on Election Day in 2106 who lost insurance because of Obamacare. There are still plenty of problems with the ACA and with the U.S. healthcare system overall. Costs are still rising faster than inflation, with a growing portion of many families’ disposable income going toward healthcare instead of rent, food, education or savings. While the cost of premiums has flattened out, the cost of deductibles, co-pays and other out-of-pocket expenses has soared. The Affordable Care Act remains a misnomer, because healthcare remains far from affordable for many families. Obamacare also faces a serious Supreme Court challenge in a case known as King v. Burwell, with the justices due to issue a ruling in June. If they side with the plaintiffs, the law will become invalid in 34 states and will basically cease to function. Nobody knows how the justices will rule, but striking down key provisions of the law would suddenly make healthcare a top issue in the presidential campaign once again. If the ACA survives the Supreme Court, on the other hand, legal challenges to its existence may wind down, and negative publicity could finally subside. And Republicans may need to find something else to get voters fired up about.